The Simple Map Viewer is for viewing one natural resource theme at a time such as farmland soils, wetland soils, protected open space, natural diversity data base areas, and water quality classifications. Select the map theme to display and optionally overlay it on aerial photography or elevation. 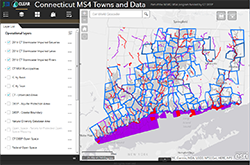 The simple map viewer includes links to CT ECO Data Guides and Resource Guides that explain each map theme. Map themes in the simple map viewer closely correspond with the maps available in the Map Catalog. The Advanced Map Viewer is an interactive map viewer that provides more tools than the Simple Map Viewer as well as the possibility to combine many different data layers. 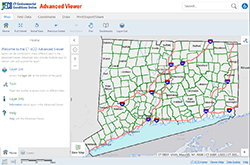 The Aerial Imagery Viewer is designed for viewing digital aerial photography (imagery) available for Connecticut, certain regions in Connecticut, and along the Connecticut coastline and Connecticut River. It includes a collection of black and white, color, and infrared imagery published by various state and federal agencies. Refer to Connecticut Digital Orthophotography for descriptions of aerial photography available in CT ECO. The CT 2016 Viewer is designed for viewing the 2016, high resolution, 3 inch, 4 band digital aerial imagery for Connecticut. The viewer is designed to be used on all devices from mobile phones to large desktop screens. The viewer contains zoom, address search, locate me and share. The Elevation Viewer includes a statewide digital elevation model (DEM) that can be displayed as hillshade, shaded relief, slope or aspect. 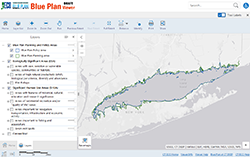 The purpose of the Long Island Sound Blue Plan is to identify and protect places of traditional use and ecological significance, and to minimize conflicts, now and in the future. This includes preserving a collective vision of Long Island Sound, and facilitating a transparent, science-based decision-making process. The Blue Plan Map Viewer contains data layers for the plan in a format for exploration. 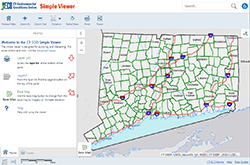 The CT MS4 Viewer includes data layers that are helpful in registering for and complying with the 2017 CT MS4 General Permit. CT DEEP and UConn CLEAR have collaborated on a project to make Connecticut's freshwater fish community data (historical and current) available to the public. The Fish Community Data Viewer allows users to search DEEP fish or macroinvertebrate community data for inland waters by town, waterbody or fish species. Fish and macroinvertebrate counts are available for thousands of sample sites across Connecticut. 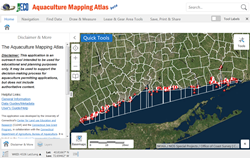 The CT Aquaculture Mapping Atlas was developed by the University of Connecticut's Center for Land use Education and Research for the Connecticut Sea Grant Program, in collaboration with the Connecticut Department of Agriculture, Bureau of Aquaculture. It is intended to be a resource for industry managers and aquaculture enthusiasts. The Atlas includes up-to-date coastal and marine data layers including state and municipal shellfish beds, shellfish area markers, shellfish sampling stations, aquaculture gear areas, recreational and natural shellfish beds, areas licensed for seaweed production, shellfish classification areas, eelgrass beds, and more. Please note the Atlas is an outreach tool intended to be used for educational purposes only. 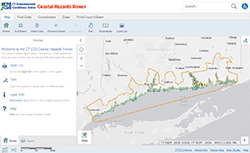 The Connecticut Coastal Hazards Viewer is designed to allow users access to several pertinent suites of data for coastal Connecticut. Presented here are data representing sea level rise, high-resolution coastal elevation, hurricane storm surge, coastal erosion, and environmental observations such as tides, water quality, waves and currents. The Carbon Stock and Land Cover Viewer displays the results of a research study. Visit the section on CT ECO to learn about the research and view the maps. Refer to the Data Guides to learn about the data layers. Refer to Connecticut Digital Orthophotography for descriptions of aerial photography available in CT ECO.